Love Pray Grow: What is the "Singaporean Language"? Ten years ago on a flight to Europe, I was struck dumbfounded by a stranger for the first time in my life. I was seated next to a friendly Caucasian lady. We chatted happily about our holiday destinations before she asked me, "You're from Singapore, so what language do you speak?" I was confused and my eyebrows creased for good measure. I mean, I had been speaking in English to her all along, wasn't the answer obvious? I relaxed my facial muscles, straightened my eyebrows and replied to her matter-of-factly, "English. English is my first language." Like magic, the creased eyebrows migrated to her face. "Oh? Is there no official language in Singapore, like a Singaporean language?" she enquired. I had to search my soul thousands of feet above sea level and articulate who I was linguistically. I had never thought seriously about it before, assuming everyone already knew Singapore was an English speaking country. Fast forward to today in Australia, whenever I say English is my first language in Singapore, I still get a look of disbelief. These anecdotal evidences seem to suggest that to many in the western world, there is no known Asian country which regards English as its first language. 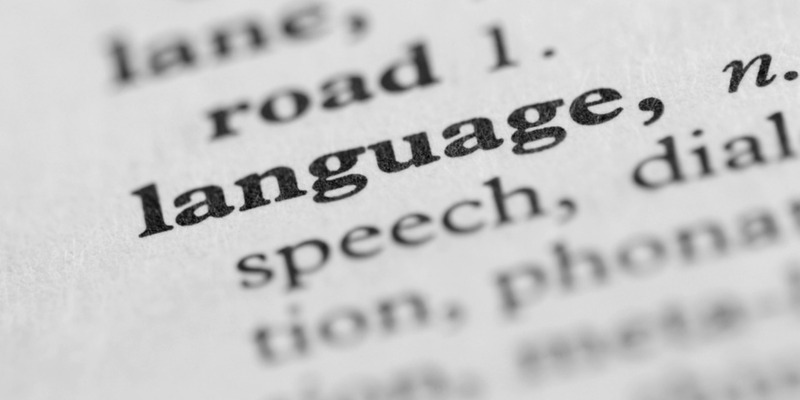 Just what is the "Singaporean Language"? I can't define it because there is none. But allow me to explain to you what languages I effectively speak, read and write, having been born and bred in the city state. Formally known as Bahasa Melayu, it is the NATIONAL LANGUAGE of Singapore. 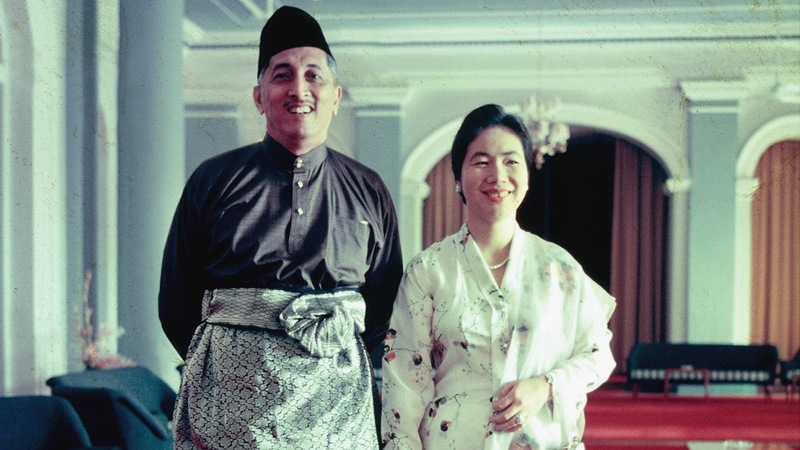 The national anthem, Majulah Singapura (Onward Singapore), which was written in conjunction with Singapore's independence from Malaysia in 1965 is in Bahasa Melayu, so are the state military drill commands and citations for state orders and decorations. Bahasa Melayu is my ethnic language, the language I was born to speak and which the Singaporean education system calls "Mother Tongue". It is a core module which all students studying the language have to learn and pass at school exams every year for 10 (some 11) years of formal foundational schooling. 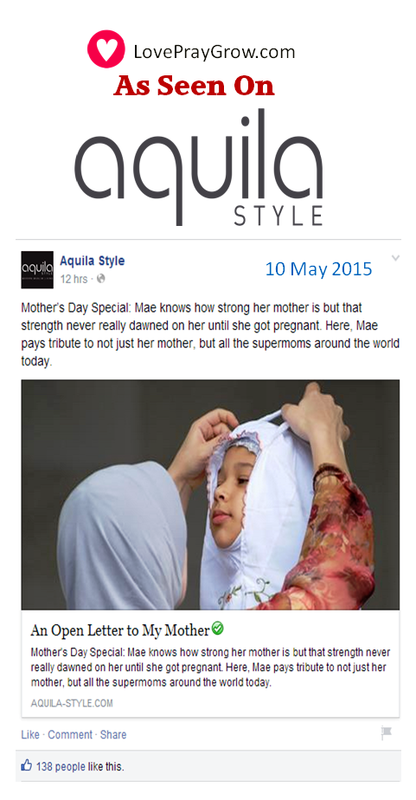 Bahasa Melayu is spoken mainly by the Malays who make up about 14% of Singapore's population. I wasn't trying to sound westernised when I said English was my first language. My educational certificates officially marked the module as "English as First Language". It is a core and examinable module taught in schools for up to 11 years, which all students must pass as well as they could or achieve at least a minimum prescribed grade, without which advancement to the next educational level would be a big challenge, if not almost impossible in some cases. The Singaporean work and official correspondences are expressed in English. Singaporeans of various races largely communicate with each other in English. 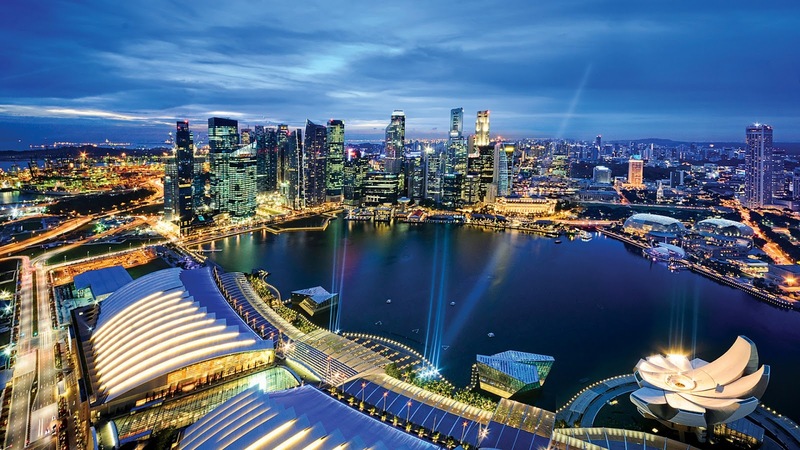 The language was first introduced in Singapore by the British in the 1800s and has remained as a major language in modern Singapore for economic reasons. That makes English the country's LINGUA FRANCA and WORKING LANGUAGE. It is a language I was born into, which I use as comfortably as I do Bahasa Melayu. 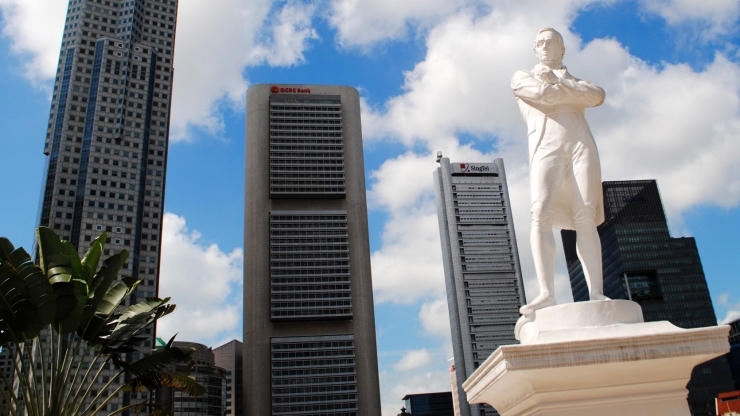 Statue of Sir Stamford Raffles, Singapore's founder in the 19th century, at Boat Quay in Singapore. "Language of the street" in Singapore, one which infuses words from other languages (namely Malay, Chinese, Tamil) with English. Sentences are often grammatically incorrect by formal English standards. 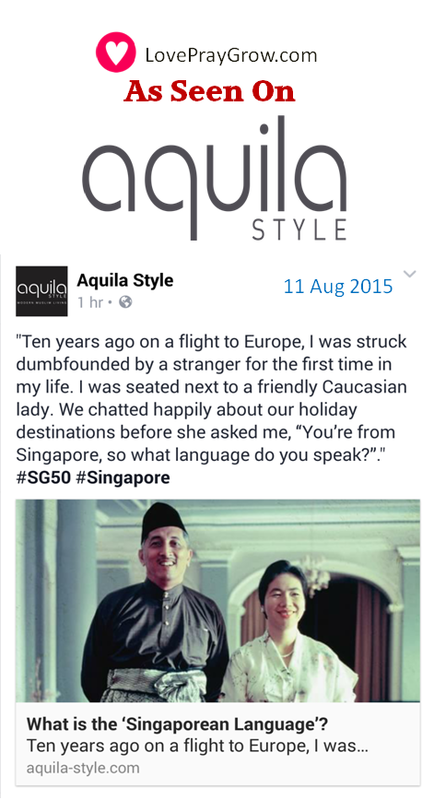 It is a colloquial language which connects true blue Singaporeans with each other because no "outsider" is able to understand Singlish as well as Singaporeans do, let alone use it effectively. It is uniquely Singaporean, if you like. Maybe, just maybe, this is THE Singaporean Language albeit an informal one. (Besides the above three languages, I also read Arabic but that's another story altogether). It doesn't end there. There are two other OFFICIAL LANGUAGES which are widely used in Singapore. A language spoken by 70% of Singaporeans. Like Bahasa Melayu, Mandarin is a Mother Tongue module taught at school for the Chinese population. Another Mother Tongue module in the Singaporean education system is Tamil. It is the ethnic language of the Indian community, which makes up 9% of the Singapore population. The Singaporean education system has made it mandatory for all learners to be taught English as the first language and the Mother Tongue (Malay, Mandarin or Tamil) as the second language, with English being the main language of instruction at institutions of all levels in Singapore. By now, you should already have a headache (in trying to figure out the linguistic combo of Singapore) and an inkling that Singaporeans are at least bilingual, if not multilingual. If you travel on Singapore's public transport for instance, keep your eyes and ears open. Public notices and announcements are expressed in all four official Singaporean languages: English, Malay, Mandarin and Tamil. A public notice in Singapore which commonly features all four official languages. As a melting pot of various cultures, Singapore is possibly one of the rare countries with so many official languages. Being multilingual and growing up with friends of various races have been very advantageous for me. Among others, it has allowed me to easily embrace human diversity and effectively take down cultural barriers in numerous social and professional situations - assets which have almost become a necessity in today's globalised economies. Thank you, Singapore for the foresight. As you celebrate your jubilee year on 9 Aug 2015, I wish you continued progress and prosperity as a nation.